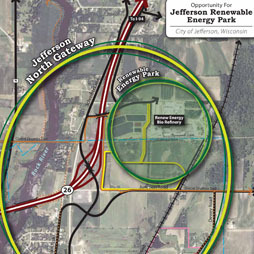 Jefferson Wisconsin renewable energy park | Vandewalle & Associates, Inc. The City of Jefferson asked Vandewalle & Associates to help assess and align Jefferson’s strategic assets and opportunities–with the goals of retaining and creating new jobs, expanding the tax base, and revitalizing the City’s riverfront. The catalyst for the effort was the 2008 flooding of the Rock River, and subsequent strategy for relocating a major Jefferson employer off of the river. While the team considered new locations for Tyson Foods’ riverfront plant, the team also looked for ways to involve the state-of-the-art ethanol plant already located in Jefferson. The plant–largest in the State of Wisconsin–has excesses of thermal energy, by-products, storage capacity, and land with ready rail and highway access. Vandewalle & Associates framed a catalytic economic opportunity for a renewable energy-focused business park that would relocate Tyson off the river, expand area innovation, and stimulate the local economy. The new business park would appeal to businesses needing reliable, redundant and affordable renewable energy, that were also seeking to maximize their triple bottom line. The project aligns with the greater Madison Region’s Thrive economic vision and the economic vision of Jefferson County and Jefferson County Economic Development Corporation.